September 1 update: Our 2018 tour season has ended. Check back at this website starting April 15, 2019 for dates of 2019 summer tours, and to make reservations. We regret that tours are not available during the September through May timeframe, as the observatory is used during that period by University of Rochester students and professors for classwork and research. Strasenburgh Planetarium and the Astronomy Section of the Rochester Academy of Science (ASRAS) offer learning and observing opportunities all year. Thanks to all our tour guides and guests for a great summer season! We hope you’ll join us for one of our scheduled tours next year in 2019. Regular Tours include a presentation on astronomy geared to a general audience, followed by a tour of the observatory and (hopefully!) observing of several objects (which may include the Moon, planets, nebulae, star clusters and perhaps galaxies). Kids’ Tours have a more interactive presentation specially aimed at youngsters, plus the observatory tour and observing. You can also sign up for a Full Moon Tour, with both presentation and observation focused on the Moon. Reservations are required for all these tours, which start at 8PM, and are limited to 8 people per reservation and 25 people per tour. We are able to host a small number of groups and a much greater number of families and individuals, so that this opportunity is offered as broadly as possible across the local community. Availability for groups larger than 8 are very limited, require special permission, and include a requirement to reconfirm the number attending one week prior to the tour. University of Rochester Department of Physics and Astronomy is pleased to offer free tours for the public at Mees Observatory in the Bristol Hills on selected Friday and Saturday evenings during the summer months. Tours requiring reservations are held regardless of sky conditions, and begin at 8PM at Gannett House on the observatory grounds. After getting acquainted, we’ll present a talk on astronomy in general and on what we may be observing later in the evening. If weather and skies permit, we’ll proceed to the observatory dome and operate the 24″ reflecting telescope for observing. Tours typically end around 11PM (if observing is possible) or whenever our guests have had their fill of photons. 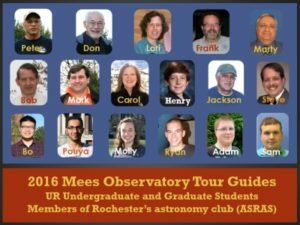 Tour guides are physics/astronomy students and members of Rochester’s astronomy club, the Astronomy Section of the Rochester Academy of Science. There are many other opportunities to do astronomical observing in the Rochester area. 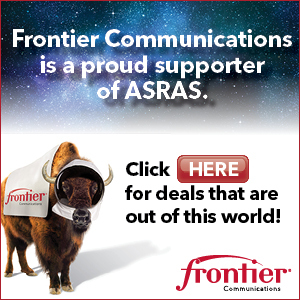 Rochester’s astronomy club, The Astronomy Section of the Rochester Academy of Science (ASRAS), offers free public star parties in all but the coldest months; these are usually held at Mendon and Northampton Parks. ASRAS members also operate the telescope at Strasenburgh Planetarium’s observatory on nearly all clear Saturday evenings, year round. 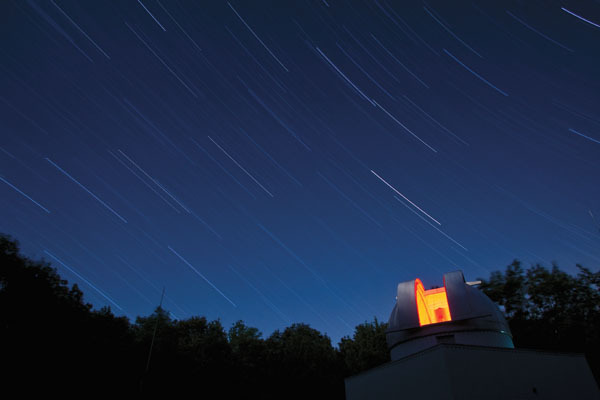 Monthly Open Houses at the Farash Center for Observational Astronomy in Ionia offer yet more opportunities for exploring the various observatories and looking through a variety of telescopes. Join us for any of these free events. To learn more about these and other opportunities, go to www.rochesterastronomy.org. For more information, contact the Mees Observatory Tours Director, >Carol Latta at cosmos@astro.pas.rochester.edu or cell phone 585-230-9548. Be aware of detours near Mees this summer which may increase your travel time.